Pearl Sawyer, pictured on right, speaking at the U.N. Commission on the Status of Women parellel event sponsored by the Scottish Women’s Convention in New York City. 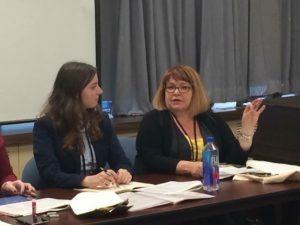 On March 17, Pearl Sawyer, executive vice president of UFCW Canada Local 1006A, served as the keynote speaker at a U.N. Commission on the Status of Women parallel event sponsored by the Scottish Women’s Convention in New York City. Sawyer presented a paper on behalf of UNI Global Union and UNI Equal Opportunities on the digitalization of work and the effect on gender. One of the key findings presented was that 47 percent of current jobs being performed across the globe are amenable to being potentially computerized. The types of jobs that will be affected by digitalization will have a direct impact on positions held by women. The effects of this will require workers to invest in further training and lifelong learning. Unfortunately, this can pose a challenge for women as they can neither afford it due social, cultural and economic barriers, or they cannot fit this need with their family duties and their need to work. Digitalization of work will also lead to a widening of the technology gap. However, a study from the World Bank predicts that if we double the pace at which women become frequent users of digital technologies, the workplace could reach gender equality by 2040 in developed nations, and by 2060 in developing nations. With the right skills and education, people, particularly women, can use technology to create and capture value. Creative, problem-solving, and social skills will be key skills in the 21st century, especially in those areas where computers are still challenged to match human proficiency.